Exclusively for our catamaran guests, they can all be booked with a minimum of only two guests. All tours depart from the Belize Express dock or the Airport, San Pedro, Ambergris Caye. These rates are "by boat", meaning that you start and end the tour with a 1,5 hour water taxi between San Pedro and Belize City. An upgrade to fly to/from Belize City is available for 55 USD. The flight only takes 20 minutes each way so it can be well worth it for saved time and added comfort. The tours by boat generally starts at 5.30 am and return time depends on the tour, maximum 7 pm. The tours by air generally starts at 6.30 am and return time depends on the tour, maximum 6 pm. All traveling between the sites is in an air-conditioned van with refreshments on-board. Refreshments included are: water, soft drinks, beer and rum punch. All tours includes breakfast, served before boarding your water-taxi or flight. A Belizean lunch is included on all tours, either buffet style at the site for cave-tubing and zip-line, or at a restaurant in San Ignacio, depending on the tour. This tour includes flights to/from San Pedro and Orange Walk, where Lamanai is located. No boat option is available. The flight departs at 9 am and you are back in San Pedro at 4 pm. A Belizean lunch with refreshments is included, as well as water for the tour. Experience an underworld Mayan site! The caves were an important part of the Mayan religion and culture and were used as ceremonial sites. When the tour starts you will be given a life vest and an inner tube. You will then take a short walk, where you will cross a river and begin your hike on a designated trail through the jungle, to the entrance of the cave system. Here you will wade into a river, sit on your inner tube and float leisurely through the cave system, experiencing the sacred underworld of the Mayan people. As you float down the river, you will experience the wonder of crystalline animal and bird-shaped stalactite formations and thousand year old artifacts. At the end of your cave-tubing journey through this astounding cave system, you will float out into the open, under the canopy of the majestically tall trees lining the riverbanks, until you end up right back where you started walking. Do not miss this adventure - Belize is the only place in the world where cave-tubing can be done! 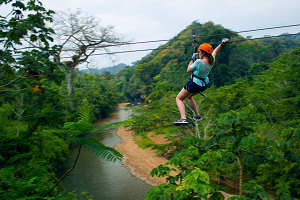 Get a "birds view" of the jungle while zipping from treetop to treetop, this adventure is both thrilling and beautiful! There are zip Line platforms as high as 85 feet and as far apart as 250 feet.. A short 5 minute walk in the rain forest will bring you to the start of this excursion, where you will be instructed on the zip-line technique and method. The guides will help you with your gear, your harness, helmet and hand gear in preparation for your aerial adventure. Double cables are used for ultimate safety. All landing platforms are equipped with safety gear, handrails and guides to meet you at your next landing as well as to ensure your personal safety throughout the tour. This adventure is a favorite for all ages! The Xunantunich Mayan Ruins are by far the ruins with the most archeological importance in the country of Belize. Here you will find the most detailled sculptures and one of the tallest Mayan structures. They are situated in the tropical rainforest, close to the Guatemalan border in the beautiful Cayo District, often referred to as "A Tropical Switzerland", with rolling green lawns, palm trees, plantations and mountains. Xunantunich was a major ceremonial center during the Classic Period. The site is composed of six major plazas, surrounded by more than twenty- five temples and palaces. The name is Maya for "stone lady" and is derived from a local legend. The Belize Zoo & Tropical Education Center is settled upon 29 acres of tropical savanna and exhibits over 125 animals all native to Belize. The Zoo was started in 1983, as an effort to provide a home for a collection of wild animals which had been used in the making of several documentary films about tropical rain forests. The Zoo keeps animals that were orphaned, born at the zoo, rehabilitated animals, or sent to the Belize Zoo as gifts from other zoological institutions. The Actun Tunichil Muknal (ATM) Caves are 1 hour and 20 minutes from Belize city and 45 minutes natural hike through the jungle. The hike includes the crossing of several shallow streams and passes through 6,700 acres Tapir Mountain Nature Reserve. Because of this passage through, this cave is known to only a few guides, who have permission from the Belize Department of Archaeology to take visitors to this special cave. The Maya used the cave to conduct rituals and sacrifices to their gods. To this day the cave has not been looted and nearly all the cultural artifacts have remained in place as they were originally found in 1989. Your guide takes you about a mile into the cave. After squeezing through a few tight spaces and wading through knee-deep water at times, you reach “The Cathedral,” - a large open room filled with scattered remains of 1,200-year-old Mayan civilization: pottery, evidence of fire and bloodletting — and indeed bones of sacrificed humans. The remains of over a dozens human skeletons have been found in the cave. The most magnificent of these is the so-called “Crystal Maiden,” a totally intact and fully calcified skeleton of a sacrificed girl believed to be about 16. A minimum height of 40” and adequate physical fitness is required for this hike adventure. To enter the mouth of the cave, visitors must swim across 25 feet of water that is approximately 8 feet deep (guides are available to help weaker swimmers). Please be aware that photography no longer is allowed in the cave since an incident in 2012 when a tourist dropped his camera on a skull and damaged it. The day starts with a beautiful 20 minutes plane ride over northern Belize’s reef, coastline and lowlands to the Orange Walk district. The flight leaves San Pedro at 9am and takes you directly to the airport at the Orange Walk district. A short drive (approx 10 minutes) in a van brings you to Lamanai Landings, where you will be met up by your Lamanai guide and boat captain that will take care of you during the day. First you will enjoy a relaxing boat ride up the New River. This is a true wild jungle river ride where the flora and fauna abounds with hundreds of different species of birds, fresh water turtles, green iguanas, insect bats, wild orchids, monkeys and crocodiles (Lamanai is Mayan for "Submerged Crocodile")! At the entrance to the New River Lagoon, the ruins of Lamanai rise into view. The ruins has a unique setting at the New River Lagoon within the tropical rainforest of central Belize. With only jungle for miles around - the view if you climb up to the top of the 112 feet high temple is breath-taking! Lamanai is one of the only sites in the world that allows their visitors to actually climb up the ruins! The tour of Lamanai is a cultural and historical lesson on the Mayans and their fascinating history. There is also a small museum and a souvenir shop.